Sylvie is dying in a hospital bed while her mother and doctors watch her life slipping away. But one of them offers her a chance. There’s an alternative community – Stonewylde – hidden in a remote corner of Dorset, and if Sylvie can visit then the clean air and green lifestyle might restore her. Or give her some measure of peace before she dies. It’s a chance, and when Sylvie and her mother take it they find themselves in a haven of beauty and tranquillity. But it is not all idyllic. As her forbidden friendship with a secretive Village boy grows Sylvie glimpses the truth behind the paradise she’s entered. All is not quite as it seems at Stonewylde. I honestly don’t know how to review Magus of Stonewylde. I know it is one of the self-publishing phenomena that has now garnered a traditional publishing deal. I know that many people rate the Stonewylde series incredibly highly (of which Magus of Stonewylde is the first). There were many favourable aspects of the book for me, but a lot of it simply didn’t work in my opinion. I will say that Kit Berry writes with great skill and warmth. Despite my issues with Magus of Stonewylde, I still had an enjoyable reading experience and looked forward to when I could pick up the novel. The simplicity and grace of the prose is a great strength. Berry also clearly has respect for the English countryside. Where her descriptions of the flora and fauna dominated, I felt all my scepticism receding and thoroughly enjoyed the read. I also want to remark on the characterisation. Sylvie is a sweet and passionate young girl; Yul is an incredibly well-drawn protagonist for whom I felt an enormous sympathy; and, in the form of Magus, we have a wonderfully sinister individual who professes to have the best interests of his people at heart (much like Mayor Prentiss from the Chaos Walking trilogy by Patrick Ness). My issues stemmed with certain aspects of the plot. First of all, I think that the Stonewylde series would have succeeded thoroughly as a YA fantasy, rather than as some odd mish-mash of contemporary and mysticism. If the community of Stonewylde had been a place from a fantasy world, I would have had no issues whatsoever. I found it very difficult to reconcile the idea of this remote community with our modern day. There were glaring references to the Internet and computers in a place where a feudal system is still in place; I did not like this. I also disliked the contrived manner in which Sylvie is brought to Stonewylde. Her mother, Miranda, is presented as a clever individual, and yet succumbs in a naive fashion to the blandishments of a man she has never met before. She gives up every aspect of her ordinary life and the access to doctors on the words of someone who tells her that her daughter might be okay by moving to the countryside. I’m afraid my scepticism abounded at this point. Miranda, herself, is one of my issues. SO frustrating! I guess this could be equated to good writing on the part of Berry, if it is intended, but it damaged my reading experience. Miranda seems so strong and capable, but then becomes this lovelorn woman whenever Magus is around – despite his cold treatment of her, and his use of her as a broodmare to bear his children. I never appreciate doormats in my reading. Speaking of the broodmare aspect – ye gods! This book was just FULL of inappropriate sexual references. The idea that these Villager women were being used by the Hallfolk to bear their children. Sure, it was presented in the form of pagan ceremonies, but it made me feel enormously uncomfortable. As did the fact that everyone seemed fixated on menstruation. Oh, and don’t get me started on the fact that Miranda was raped to bear Sylvie – this was referenced casually and never brought up again. 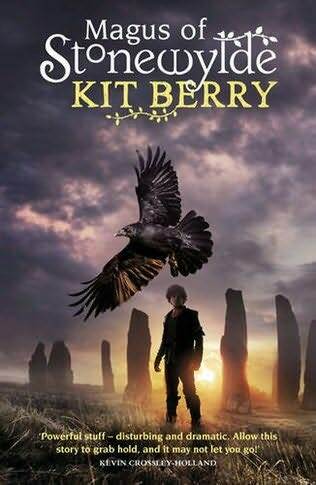 I sincerely hope that this is explored in a later novel, otherwise Berry is just using it for sensationalism, which is appalling. This last point might be very much a personal problem, but Berry also uses the word ‘moongazy’ a lot, which I find incredibly cutesy, and I ended up gritting my teeth every time it was referenced. This might just be me, however! Altogether, I found myself reading avidly, but at times not being entirely sure why, hence my very mixed-up review. I definitely think that Kit Berry has talent as a storyteller, but the Stonewylde series requires just TOO much suspension of disbelief for my liking. D’you know the problem? I liked it *just* enough that I want to read the second book in the series, but I suspect I shall find the same irritating issues with plot in that one! Worth reading in terms of writing skill, and to judge whether this self-published author should have been picked up by Orion.